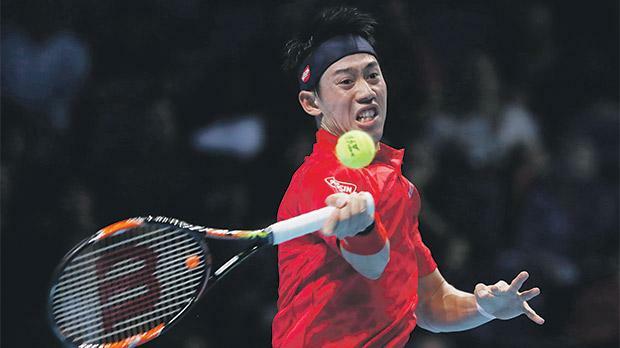 Kei Nishikori hits a shot against Stan Wawrinka at the ATP World Finals, yesterday. Stan Wawrinka’s hopes of reaching a fourth consecutive semi-final at the ATP World Tour Finals were dented by an opening loss to Kei Nishikori. The third seed, who sported a poppy on his shirt, had never previously lost to anyone at the O2 Arena other than Roger Federer, Rafael Nadal or Novak Djokovic. But he was well below his best and fifth seed Nishikori ran out a convincing 6-2 6-3 winner. The victory boosts Nishikori’s hopes of overtaking Wawrinka to finish the year as world number three. He said: “That’s my goal for this week, try to win matches and try to reach number four or number three. Wawrinka led their head-to-head 4-2, winning their most recent meeting in the semi-finals of the US Open before going on to win his third grand slam title. But, brilliant as he can be, the Swiss is also erratic and there were far too many errors in the opening set in particular. Nishikori’s movement was sharper and his ball-striking cleaner, and he earned his rewards with five games in a row to win the first set. Wawrinka’s struggles were rather summed up by two double faults to hand Nishikori a second break of serve, and the Japanese star clinched the set with a fine backhand volley. Nishikori’s net play was a feature of the set, the fifth seed winning seven points with volleys. Wawrinka tried to fire himself up at the start of the second set and initially played better, but he then misjudged a return that landed on the baseline and was broken in the fifth game. The 31-year-old never looked like recovering and, when he drilled a backhand long after an hour and seven minutes, the match was over. “It was not a great match compared to what I can do, that’s for sure,” Wawrinka, the oldest player in the eight-man draw, told reporters. “Wasn’t a great day for myself. “It’s not the first time that I lost the first match here,” Wawrinka added. “Last year I lost against Rafa, really bad match. “I’m sure I still have something inside me to play some great tennis before the end of the year, so I’m going to try everything for that in the next match.